Not that I have been in any hurry to see summer end and the colder weather arrive, but I’ve really been looking forward to Autumn, just so that I could go flying and see the fall colors from the air. By the time I got around to starting pilot lessons last November, all the leaves had already fallen from the trees, so I’ve been waiting for this chance for nearly a year now. As we know all too well, the weather in Alaska doesn’t always cooperate with our desires to fly airplanes, and since early fall can be quite wet around here, I’ve had to play the usual waiting game. Fortunately, my schedule coincided with one partly cloud-free day last week, so I jumped at the chance and got in a couple more hours of 172 time. I hadn’t been south lately, so I decided to head down over the Kenai Peninsula and make it a cross country trip to Soldotna. Taking off, I climbed to cruise altitude, crossed the Turnagain Arm, and discovered one of the real joys of fall flying, the stability of the air. Unlike in the summer, where you encounter numerous pockets of warm rising air that have you fighting to hold a steady altitude, the airplane stays perfectly trimmed this time of year. The cool, steady air makes the airplane perform exceptionally well, and as long as the wind isn’t blowing too hard, it just makes you feel like a better pilot. At least that was my experience, still being at this for less than 100 hours. Even though the airplane that I was flying had a GPS installed, I navigated soley with my eyes, my sectional chart and the Nav radios. Not that I’m any kind of old school traditionalist… ok, so I am one of those guys in some regards, I just figured that it was good practice for me to find my way by referencing the terrain and landmarks, and using the Kenai VOR and the Soldotna NDB. That’s not to say that I didn’t play with the GPS at all, and in fact I occurred to me that it might be good to keep it on the current LAT/LONG display window. If you ran into trouble, or had to make an emergency landing, having that info right in front of your eyes would allow you to relay your exact coordinates to ATC or the local FSS without having to distract yourself and spend precious seconds fiddling with the knobs on the GPS. As I flew, I keep my eyes open for possible landing spots, should the unlikely need arise to put the aircraft down unexpectedly. There are a few small strips on the northern side of the Kenai, but there are also alot of trees and thick forests, so it would take a good sense of awareness to find a suitable landing site in some areas. Depending on your terrain, that’s a good argument for not flying too low. As I got closer to Skilak Lake, I flew over the Sterling Highway and turned west to follow it towards Soldotna. I’d been to the Soldotna airport once before and for the most part, I remembered what it looked like, but even so, sometimes your mind can play tricks on you as you fly. I passed a couple of the smaller airports along the highway and had to reassure myself that neither of those were my destination, partly because the ADF needle still pointed west. I can see how a pilot could get lost in places like the midwest where there are so small many airports dotted all over farmland that all looks very much the same. Sure enough, though, I found the right airport, announced myself in the pattern and came in for a very smooth landing on runway 7. I’m finally getting a handle on controlling my descent speeds in these 180hp C172s. There wasn’t much going on there, so I just taxied back and took off again, this time heading a little bit closer to the mountains as I made my way back to Anchorage. Along the way, I took a very small detour and explored a wide valley just to the south of American Pass to check out some of the fresh snow that dusted the higher peaks on the Kenai front range. The pass itself was clouded over, so I didn’t even entertain the though of trying to go that way, instead I just circled around a low mountain before resuming my course home and landing back at Merrill. I’ll save that for another day. Another flight, another learning experience, I’m continuing to figure things out for myself and solidify my navigation and overall piloting skills. Oh, and the scenery wasn’t too bad either, between all the golden foliage in its peak color and the fresh snow. Looking at all the snow makes me excited to fly again this winter! 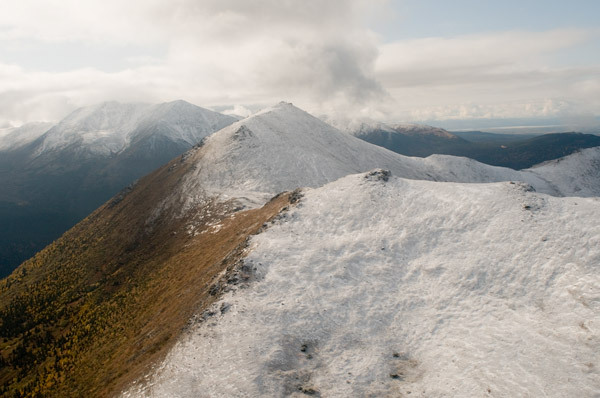 This entry was posted in cross country, Scenic flying and tagged Cessna 172S, Soldotna. Bookmark the permalink.